Solve three of the four bottom corners. Step 1 and 2 have solved the bottom layer up to one corner. We want to move corner cubies withouth disturbing the white cross. Use Y = FRiFiR to swap corner cubies from the U-layer into the D-layer along a vertical edge. Choose between Y and its inverse Yi to get the orientation right at the same time. The bottom corner cubie is in the top layer. Use inverse Yi = RiFRFi. 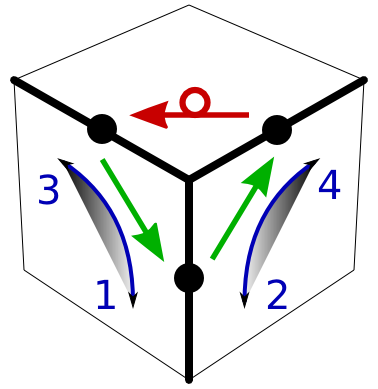 Notice that in the first two examples we pick Y or Yi so that the first quarter turn moves the cubie into the solved position, which is also the position at the end of the move. A bottom corner cubie is in the bottom layer, but not positioned or oriented correctly. 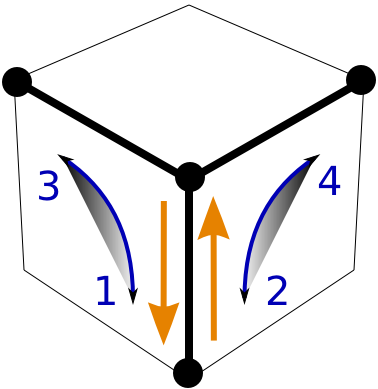 Use Y or Yi to swap the cubie to the top layer and proceed as in 1. Pick Y or Yi to get one of the simple subcases of 1. Which of the four corner cubies is left unsolved is up to you. Usually, some corners are more easily dealt with than others, so do them first. The remaining corner cubies might even move into a better position at the same time. We suggest the 3*Y move above because it is straightforward. However, shorter moves are possible by using Y along different edges or using other elementary ideas altogether. Do the Y-move along the up-right edge from front to back (RUiRiU). Do the Y-move along the up-left edge from front to back in reverse (FiUFUi). The last Ui is irrelevant, so we need 7 elementary moves compared to the 12 moves in 3*Y. If you count U2 as one move, you can also do this in 6 moves. Do the Y-move along the up-right edge from front to back without the last U, which is RUiRi. Finish with FiU2F, which picks up the missing U.